Statoni Racing Team was formed in 2010 when Toni and Stacey Nesbitt were the first sisters to compete in the Canadian CBR125 Challenge championship. Both were born in Northern Ireland and now reside in Quebec. At 14 years old Stacey made history becoming the first lady in Canada to win a national motorcycle road racing championship by clinching the 2011 Canadian CBR125 title. Her first podium coincided with her first national win. The season included five wins, two podiums and setting a lap record at St-Eustache. Stacey also won the 2011 R.A.C.E. Superseries CBR Cup regional championship. Both titles were achieved in only her second full year of racing. Toni decided to stop racing having started her adventure in 2009. 2012 saw Stacey win the inaugural Canadian CBR250 Championship, capturing her second national title with two wins and finishing on the podium in all ten rounds. The season included an invitation to the 2013 Red Bull Rookie tryout and a wild card entry for the final round of the Asia Dream Cup under the Losail floodlights in Qatar. 2013: Stacey ran a RS250 Honda in R.A.C.E. Superseries and a few CSBK rounds on the FTR Honda CBR600RR. She was invited back to the Red Bull Rookies selection event, making it through to the final day but not making the final 12 places. She finished the year by taking in the International Sunflower Trophy race in N. Ireland. 2014 was successful on the Honda CBR600RR. Stacey finished 2nd in the Amateur Sportbike and 3rd in Amateur Superbike Canadian national championships, including two race wins, two second places and one third place podium. Stacey won both Amateur 600 and Amateur Superbike R.A.C.E. Superseries championships. 2015: Stacey joined the Pro ranks finishing 6th in the Canadian Superbike Championship (CSBK) Pro Sportbike and 8th in Pro Superbike. She achieved her goal of becoming Pro Rookie Of The Year, setting another first as the only female to win Pro Rookie. 2016: Stacey contested limited rounds of the Canadian Superbike Championship on board her 2014 BLK RDR by Motovan Honda CBR600RR. She still managed to finish 9th overall in (CSBK) Pro Sportbike and 20th in Pro Superbike. She also raced a couple of R.A.C.E. Superseries rounds getting her first Pro podiums at rounds 2 and 4 in Pro 600. 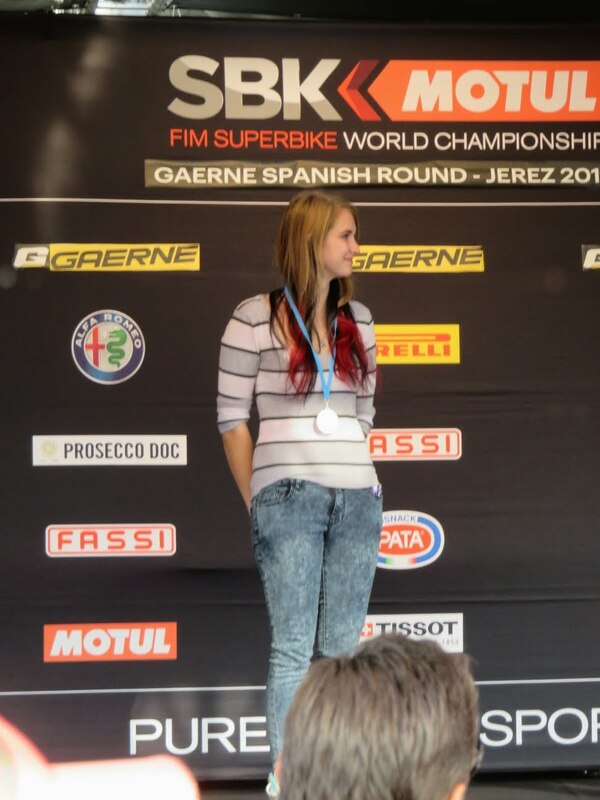 Stacey had a busy schedule also competing in the European Junior Cup held at select rounds of the World Superbike Championship. Her best result was 17th at Misano, ITA. She finished 2nd overall in the European Women's Junior Cup championship. Stacey finished the season with a return visit to the International Sunflower Trophy race at Bishopscourt in N. Ireland to race the Supertwins class..
2017: Stacey finished 7th in the Canadian Superbike Championship (CSBK) Pro Sportbike.class). - CRCA "Rider of the Year"